Ormond Road, by City on a Hill. 7 wins from 2000m to 2200m, NZ$120,610, Manawatu RC Courtesy Ford H., Marton JC Evans Henderson & Woodbridge H., Taranaki RC La Nuova Apparelmaster H., WRC Dianne's Birthday H., 2d CJC Metropolitan Trophy, L, Warstep S., L, Hawkes Bay PGG Wrightson H., Egmont Cup, 4th Canterbury Gold Cup, Gr.3. This is her third foal. Her second foal is a 2YO. Her first foal is unraced. Ormond Road (City on a Hill). 7 wins. See above. Troup Road. 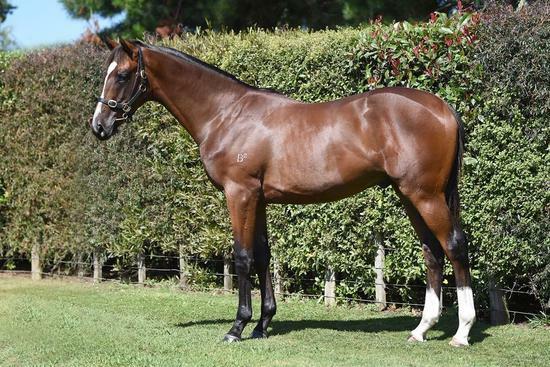 3 wins at 1600m, 2100m, Hawkes Bay Tremains Starting Gates H.
Citadelle. 2 wins at 2050m, 2100m, 2d Hawkes Bay Bay Ford New Zealand Punter of the Year H., Marton JC John Turkington Forestry H.
Electronic Cross. 8 wins from 1000m to 1600m, A$114,165, MRC Turf Ruler H., 2d MRC Palphar H., Hydrogen H., 3d MRC Geoff Murphy H., Galleon H.
Ricky Bobby. Winner at 1200m, 3d Hawkes Bay Bay Ford H., WRC Hiremaster Party & Events H., Wanganui JC Stevo's Distribution H.
Pub Singa. Winner. See above. Near Miss. Winner at 1600m, 3d ARC Dunstan Stayers Championship Qualifier. Producer. ELEGANCE (Sky Chase). 7 wins from 1200m to 2000m, NZ$76,340, WRC Cuddle S.H., Gr.3, Marton JC Ivomec Eprinex H., Manawatu RC Faltaat H., Flair H., 2d Manawatu Breeders' S., L, 3d Manawatu Breeders' S., L. Producer. VARINO (Varick). 9 wins from 1200m to 2000m, A$227,880, STC Christmas S., L, NSW Tatt's RC Tattersall's Club Cup, L, BTC Marco Polo H., STC Rider Hunt Series H., Truscott's Toyota Welter., Canterbury Hurlestone Park RSL H., Membership H., QTC Bengalla Lad H., 2d STC Siemens Mobile H., 3d AJC Hall Mark S., L, Bridgestone Tyre Centre Welter H., STC Macquarie Bank P.H. JET STYLE (Tycoon Ruler). 9 wins from 950m to 1600m, A$237,830, BRC Brisbane H., L, Qld Tatt's RC Recognition S., L, BRC Mt St Michael's College H., Redpath Golden Jubilee H., 2d BRC Little Fish Swim School Quality H., 3d BRC Biflex H.
HOLLYWOOD FRED - CH'EONJIJEWANG (Kor.) (Sanction). 8 wins-1 at 2-from 1000m to 1800m in Aust. and Korea, SAJC Fulham Park P., L.
Ascot Lady. 2 wins at 2, A$80,450, MVRC Gold Bake Pies 2YO H., Leopardstown 2YO H., 4th MVRC William Crockett S., L. Producer. FELTRE (Show a Heart). 8 wins from 1200m to 1850m, A$693,333, to 2017-18, Qld Tatt's RC AM Giles & Co Chartered Accountants H., L, Des Lambart Memorial H., BRC CNW TM Scrap Metal H., SCTC Steve Venn Century 21 H., GCTC Chinese New Year H., Ipswich TC Boss Building Maintenance Pty Ltd H., 2d GCTC Magic Millions Trophy, Magic Millions Trophy H., BRC Racezone H., Rowlatt Buck Show H., 3d Qld Tatt's RC Recognition S., L, 4th Clarence River JC Grafton Cup, L.
EISHIN DEPUTY (French Deputy). 10 wins from 1000m to 2200m, 441,045,000¥, Hanshin Takarazuka Kinen, Gr.1, Chukyo Kinko Sho, Gr.2, Kyoto Sports Nippon Sho Kyoto Kimpai, Gr.3, Tokyo Epsom Cup, Gr.3, Kyoto Australia Trophy, L, Hanshin Shinsaibashi S., Harima Tokubetsu, Kyoto Takaragaike Tokubetsu, 2d Hanshin Sankei Osaka Hai, Gr.2, Naruo Kinen, Gr.3, Santa Claus S., 3d Tokyo Soshun S. Sire. A SHIN RIDER (Manhattan Cafe). 2 wins at 2, Kyoto Hagi S., L.
LENNYFROMALIBU (Unusual Heat). 6 wins at 6½f, 1m, US$442,165, Santa Anita California Cup Mile H., L, Crystal Water H., L.
HEAT DU JOUR (Unusual Heat). 5 wins from 6½f to 9f, US$277,334, Del Mar Solana Beach H., L.
Ivory Hunter (Sir Ivor). 5 wins-1 at 2-from 1700m to 2450m, Saint-Cloud Prix Sica Boy, 3d Belmont Jockey Club Gold Cup, Gr.1, Hialeah Turf Cup, Gr.2. Sire. MARUKA PHOENIX (Dance in the Dark). 6 wins at 1200m, 1400m, 255,206,000¥, Kyoto Mainichi Broadcasting System Sho Swan S., Gr.2, Hanshin Cup, L, Kyoto Shinshun S., Hanshin Hokusetsu Tokubetsu, 2d Tokyo Keio Hai Spring Cup, Gr.2, Kokura TV Nishinippon Corporation Sho Kitakyushu Kinen, L, 3d Kyoto Mainichi Broadcasting System Sho Swan S., Gr.2, Hanshin Port Island S., L.
KING JUANCHO (Robertocarlo). 16 wins from 1300m to 3200m in Venezuela, Valencia Clasico Batalla de Carabobo, L-twice, Clasico Natalicio de el Libertador, L.
WATER MONTON (Water Poet). 4 wins from 1300m to 2000m to 2018 in Venezuela, Valencia Clasico Arturo Michelena, L, 2d Valencia Clasico Propietarios Valencianos (f), L.
QUEEN CHEMIE (Chemie). 16 wins-1 at 2-from 1200m to 1900m in Venezuela, Rancho Alegre Clasico Canaima, L, 2d Rancho Alegre Copa Gran Derby Guayanes, L.
HIRABOKU ROYAL (Tanino Gimlet). 4 wins from 2000m to 2900m, 109,540,000¥, TV Tokyo Hai Aoba Sho, L, 2d Hanshin Mainichi Hai, L.
DIVER (Danzig). 5 wins, Saratoga Seneca H., Gr.3. Sire. HOOKIPA WAVE (Carnegie). 3 wins-1 at 2-from 1800m to 2400m, 190,577,000¥, Nakayama Sankei Sho All Comers, L, 2d Kyoto Kikuka Sho, L.
CRAFTY BEAR (Yonaguska). 11 wins-2 at 2-from 6f to 9f, US$321,230, Laurel Miracle Wood S., L, 2d Delaware Park Whirling Ash S., L.
BIG BANG (Neo Universe). 7 wins-4 at 2-from 1300m to 1800m, Monbetsu Hokkaido Nisai Yushun, L, 3d Hanshin Nada S.
GOLDEN INDIGO (Miswaki). 4 wins-2 at 2-at 1600m, 2000m, €4,509, 205,949,060L., Rome Premio Villa Borghese, L, 2d Rome Premio Parioli, Gr.2. OKIE STYLE (Blumin Affair). 4 wins-3 at 2-at 6f, 1m, Prairie Meadows Freshman S., L, Prairie Meadows Iowa Stallion Futurity S., L.
CHICAGO SIX (Wild Again). 16 wins from 6f to 9f, US$733,347, Sportsmans National Jockey Club H., Gr.3, Prairie Meadows H., L, Sportsman's Park Breeders' Cup H., L, 2d Sportsmans Sporstman's Park Breeders' Cup H., L. Sire. WAVE ME BY (Untuttable). 4 wins-2 at 2-from 6½f to 8½f, Calder Seacliff S., L.
OOEY GOOEY (Political Force). 5 wins-1 at 2-from 4½f to 1m, Prairie Meadows John Wayne S., L, 2d Prairie Meadows Iowa Breeders' Derby, L.
FINNEGANS WAKE (Powerscourt). 8 wins from 8½f to 1½m, US$1,594,665, Churchill Downs Turf Classic S., Gr.1, Del Mar Hollywood Turf Cup, Gr.2, Santa Anita San Gabriel S., Gr.2, San Marcos S., Gr.2, Arlington H., Gr.3, 2d Arlington Park Secretariat S., Gr.1, Belmont Bowling Green H., Gr.2, Santa Anita John Henry Turf Championship S., Gr.2, San Luis Rey S., Gr.2, 3d Del Mar Eddie Read S., Gr.1, Colonial Downs Virginia Derby, Gr.2, Aqueduct Gotham S., Gr.3. PUCA (Big Brown). 4 wins-1 at 2-at 8¼f, 8½f, US$299,406, Suffolk Downs Steve Pini Memorial S., L, 2d Aqueduct Gazelle S., Gr.2. SMOOTH CHIRAZ (Chitoz). 6 wins-2 at 2-to 6½f, US$229,554, Canterbury Park Victor S Myers S., L, 3d Canterbury Park Minnesota Sprint Championship S., L.
OKEY DOKEY KYLE (Tactical Cat). 3 wins-2 at 2-from 5½f to 1m, Remington Park Oklahoma Stallion S. (2YOc&g), L, 3d Remington Park Tishomingo S., L.
DOUBLE DEVILS FOOD (Devil His Due). 4 wins at 8¼f, 8½f, Arlington Park Misty Isle S., L, 3d Arlington Park Flawlessly S., L. Producer. CROTON ROAD (Mr. Greeley). 9 wins-3 at 2-at 1m, 8½f, US$248,449, Calder Mel's Hope S., L, 2d Calder Derby, Gr.3. SMART STYLE (Foolish Pleasure). 4 wins-1 at 2-from 5½f to 8½f, Monmouth Long Branch S., Gr.3, Aqueduct Allowance, 2d Saratoga Sanford S., Gr.2, Gulfstream Park Golden Grass S., L. Sire. DRESSAGE (Reviewer). 2 wins at 2, Belmont Cascade S., L, 2d Monmouth Long Branch S., Gr.3. Sire. STORM ROLLING IN (Catienus). 4 wins-1 at 2-at 7f, 1m, Arlington Park Your Ladyship S., L, 3d Hawthorne Powerless H., L. Producer. BADGER'S COAST (Badger Land). Champion 3YO Classic Male in South Africa in 1999-2000. 7 wins from 1400m to 2000m, R2,564,063, Kenilworth J&B Metropolitan H., Gr.1, Greyville Daily News Two Thousand S., Gr.1, Turffontein Dingaans H., Gr.2, Vaal Golden Gate H., L, 2d Turffontein Summer Cup, Gr.1, Champion S., Gr.1, Horse Chestnut S., Gr.1, Gosforth Park South African Classic, Gr.1, Clairwood Gold Challenge, Gr.1, Greyville Gold Cup, Gr.1, 3d Turffontein South African Derby, Gr.1, Gosforth Park Elevation S., Gr.2. SURFING HOME (Capote). Horse of the Year & Champion Older Classic Male in South Africa in 1994-95. 7 wins from 1600m to 3200m, R1,603,825, Turffontein Gold Bowl, Gr.1, Milnerton J&B Metropolitan H., Gr.1, Newmarket Premier's H., Gr.2, Clairwood Mainstay International Trial, Gr.3, 2d Turffontein IGN Gold Bowl H., Gr.1, Greyville Durban Gold Cup, Gr.1, Drill Hall S., Gr.2, 4th Greyville Rothmans July H., Gr.1, Gold Cup, Gr.1, Clairwood Schweppes Challenge, Gr.1, Gosforth Park Germiston November H., Gr.1. TRACK MONARCH (Track Barron). 6 wins-3 at 2-from 6f to 8½f, Del Mar La Jolla H., Gr.3, 2d Lingfield Burr S., L.
FLOATYOURBOAT (Jet Master). 5 wins-2 at 2-from 1000m to 2000m, R969,025, Kenilworth Cape Derby, Gr.1, Merchants S., Gr.2, Cape Classic S., Gr.3, Western Cape Breeders S., L, 2d Kenilworth Cape Guineas, Gr.1, Queen's P., Gr.1, Premier's Trophy, Gr.2, 3d Kenilworth Selangor Cup, Gr.2, Cape of Good Hope Nursery, Gr.3, 4th Greyville South African Guineas, Gr.2. LAND OF BELIEVE (Believe It). 20 wins, US$336,840, Penn National Pennsylvania Governor's Cup, Gr.3, Garden State Trenton H., Gr.3, Carry Back H., L, Philadelphia Park Gettysburg H., L. Sire. MR. MCQUE (Aloma's Ruler). Winner at 2, Turf Paradise Phoenix Futurity, L.
MR. PROUD ALLEN (My Boy Adam). 2 wins at 2, Mountaineer Juvenile S., L.
FISCHER (Al Khawaaneeg). 15 wins to 1400m in Aust., Malaysia and Singapore, Selangor Gold Cup, L-3 times, Perak TC Sultan's Gold Vase, L.